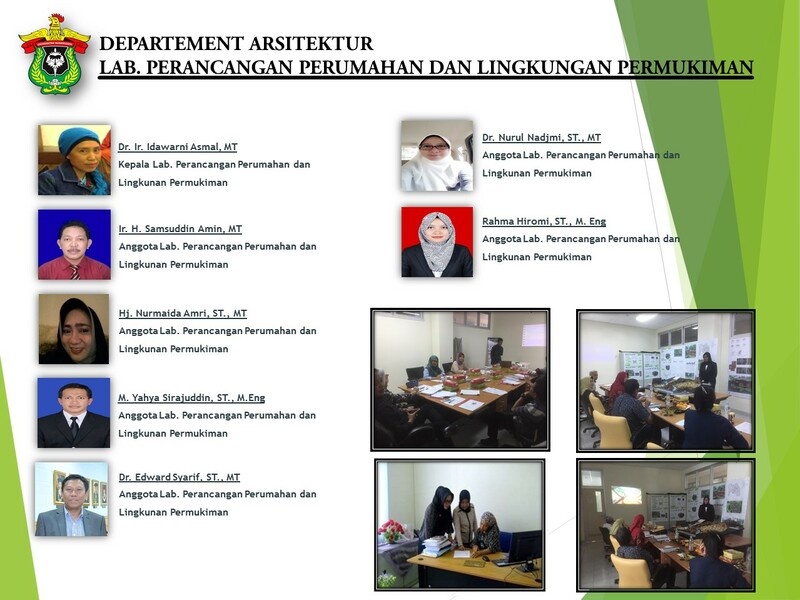 Being part of the implementation-oriented education in the field of design and research, service to the community, especially in terms of housing and residential environment that leads to Tropical Architecture in rural and urban areas of the archipelago and maritime. 1. Provide the ability to understand the theories of housing and settlements in the region urban / rural and maritime region. 2. Provides the ability to put forward theories of housing and settlements. 3. Providing the ability in designing and researching related theories of housing and neighborhoods physical and non-physical. Hj. Nurmaida Amri, ST., MT. M. Yahya Sirajuddin, ST., M.Eng. Dr. Edward Syarif, ST., MT. Dr. Nurul Najmi, ST., MT.